From deep and dirty to smooth and soulful: Logic Pro X Deep House Patches by CFA-Sound provides 69 state-of-the-art instrument channel strip patches for Logic Pro X.
Loaded with heavyweight analog-styled basses, booming FM basses, lush pads and atmopsheric sequences, followed by deep guitars, organ keys, creamy chord and finest synth sounds, an essential collection for every deep house, garage and bass house producer! 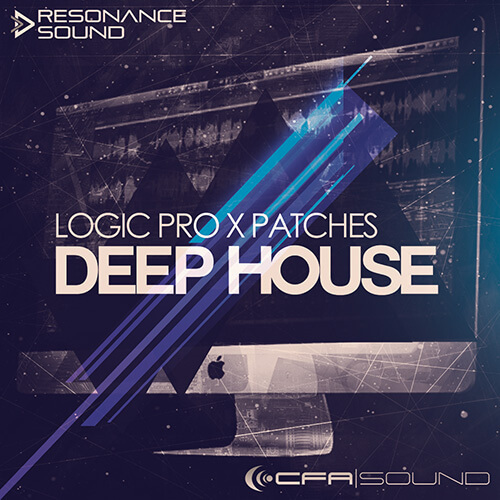 Inspired by artists like Ten Walls, EDX, Klingande, Tube & Berger, Joe Wellboy, Dusky, ZHU and Sidney Charles these Logic Pro X instrument patches providing direct inspiration for your next deep house production. All patches have been designed to fit perfectly into the mix and take full advantage of the great internal effects of Logic Pro X and are Modwheel allocated. Expect to find in detail 27 Basses, 9 Chords, 6 Keys, 6 Pads, 3 Sequences and 18 Synth sounds.